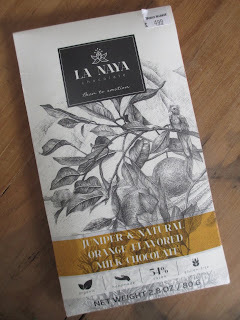 I have some more orange chocolate for you this week, this time because La Naya just makes chocolate bars look and sound so appealing that I had to try this one despite not being too fond of orange chocolate. And once again, the risk paid off: this chocolate is quite good. The fact that this Juniper & Natural Orange Flavored bar is also a milk chocolate also seemed a little odd to me: isn't orange paired more often with dark chocolate than with milk? That being said, the citrus smell when I broke the seal on the packaging was refreshing and, despite any hesitation on my part, kind of enticing. Once more, it's a pretty La Naya bar design, geometric and soft at the same time. The taste surprised me. It didn't taste like orange in the same way that it smelled like orange. Along with the orange, I also tasted strong flavor notes in the milk chocolate. Spices. 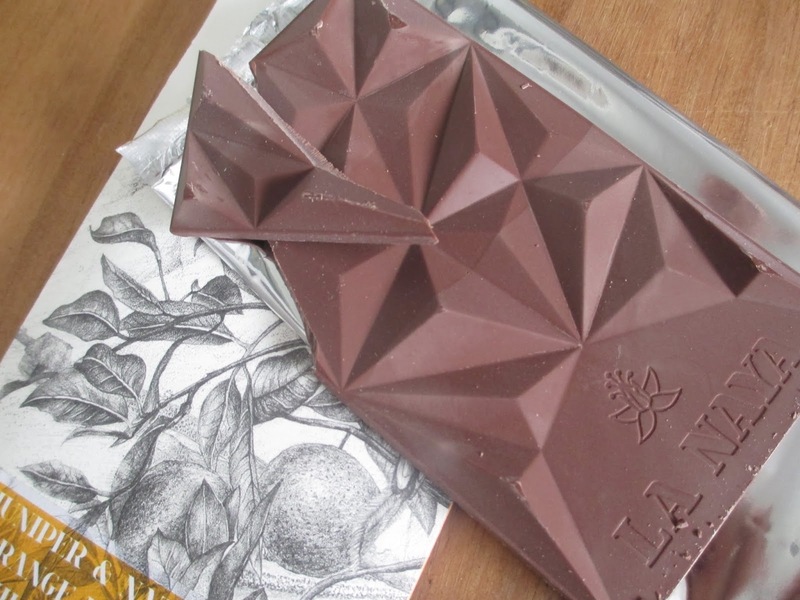 The effect made the milk chocolate appear deep and complex. The flavors mellowed out somewhat as I approached the end, which was creamier with a zing of orange zest. I mentioned that I enjoyed Chocolate Organiko's Orange and Pepper bar because it was a different and successfully different interpretation of orange chocolate. The same goes here, except perhaps in an even stronger and more poetic way. I feel like I've never tasted chocolate like this. Such flavors (mainly with the addition of juniper) usually only come in with truffles. That's where people will experiment a little or add the essence of flavor less commonly associated with chocolate. Yet why not have the same freshness in a chocolate bar, as well? I might add in the description that La Naya provides. "Emotional structure: Easter morning in Vatican, orange fruit, sunlight, imminent victory, juniper." That is absolutely a lovely description of this chocolate. And I don't need to wax poetic about its flavor because the chocolate has already done so itself. It's absolutely fascinating and fresh and intriguing and highly recommended, even if you also hesitate about orange chocolate.